Age Competitive ELISA Assay - Advanced Glycation End Products | Cell Biolabs, Inc.
Advanced glycation end products (AGE) are formed during the Maillard reaction where reducing carbohydrates react with lysine side chains and N-terminal amino groups of various macromolecules, particularly proteins (Figure 1). The advanced glycation end products can adversely affect the fuction of these macromolecules. One of the most prevalent advanced glycation end products, N-epsilon-(Carboxymethyl) Lysine, has been implicated in oxidative stress and vascular damage. Our OxiSelect™ AGE Competitive ELISA kit is designed for rapid detection and quantitation of advanced glycation end product protein adducts. The quantity of AGE adduct in protein samples is determined by comparing its OD with that of a known AGE-BSA standard curve. 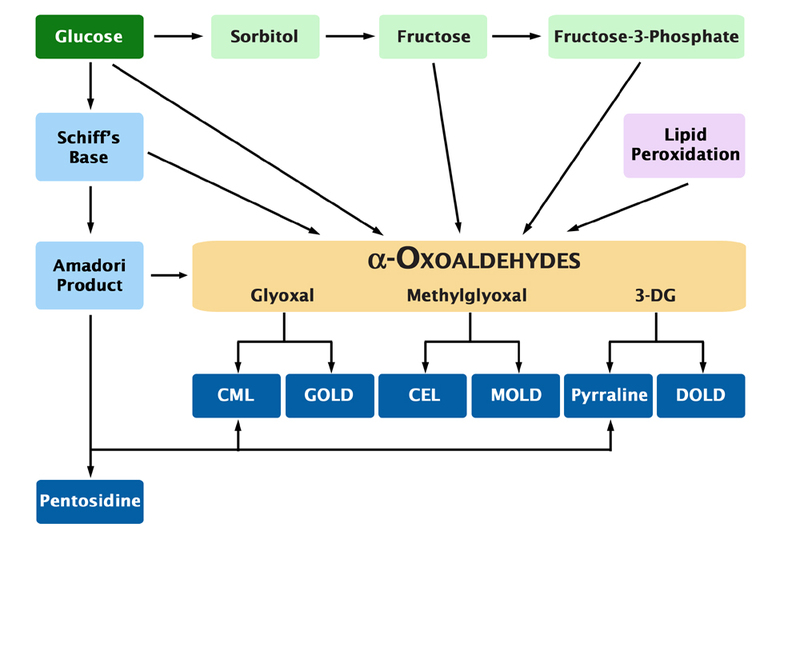 Figure 1: Advanced Glycation End Product Formation Pathways. CML = N-epsilon-(carboxymethyl)lysine. GOLD = glyoxal-derived lysine dimer. CEL = N-epsilon-(1-carboxyethyl)lysine. MOLD = methylglyoxal-derived lysine dimer. DOLD = 3-deoxyglucosone-derived lysine dimer. 3-DG = 3-deoxyglucosone. Chao, K.C. et al. (2016). Effects of ferric citrate supplementation on advanced glycation end products in a rat model of streptozotocin/nicotinamide-induced diabetes. Mol. Nutr. Food Res. doi:10.1002/mnfr.201600753. de Oliveira Caram, L.M. et al. (2016). Smoking and early COPD as independent predictors of body composition, exercise capacity, and health status. PLoS One 11:e0164290. Richarme, G. et al. (2016). DJ-1 family Maillard deglycases prevent acrylamide formation. Biochem Biophys Res Commun. doi:10.1016/j.bbrc.2016.08.077. Géhl, Z. et al. (2016). Diabetes-induced oxidative stress in the vitreous humor. Redox Biol. doi:10.1016/j.redox.2016.07.003. Flor, A. C. et al. (2016). Modulation of therapy-induced senescence by reactive lipid aldehydes. Cell Death Discov. ​doi:10.1038/cddiscovery.2016.45. Martins, L. S. et al. (2015). Advanced Glycation Endproducts (AGE) evolution after pancreas-kidney transplantation: plasmatic and cutaneous assessments. Oxid Med Cell Longev. 2189582. Chen, S. J. et al. (2015). Methylglyoxal-derived hydroimidazolone residue of plasma protein can behave as a predictor of prediabetes in Spontaneously Diabetic Torii rats. Physiol Rep. 3:e12477. Song, Y. et al. (2014). Ferulic acid alleviates the symptoms of diabetes in obese rats. J Funct Foods. 9:141-147. Foster, D. et al. (2014). AGE Metabolites: A Biomarker Linked to Cancer Disparity? Cancer Epidemiol Biomarkers Prev. 23:2186-2191.